Natural supplements for menopausal symptoms - ESI S.p.A.
Menopause is one of the most sensitive periods in a woman’s life and it is often associated with hot flashes, urinary tract problems, mood swings and weight gain. These symptoms can be relieved using natural remedies such soy and clover. 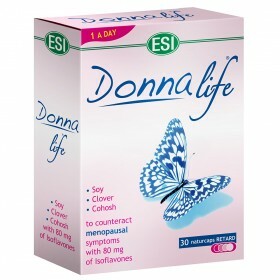 ESI has created a line of natural dietary supplement called ESI's Donna Life natural dietary supplements help to relieve typical menopausal symptoms . Donna Life is available in a slow release formula that gradually releases its active ingredients.